The main thing to consider is the flex. Flex is the amount of bend in a shaft when you swing it. The general categories are as follows: L (ladies), A (senior), R (regular), S (stiff), and X (extra stiff). If the flex of your club is too stiff, then you will lose precious distance from lack of kick. If the flex of the club is too light, then the club will be flippy and hard to control. 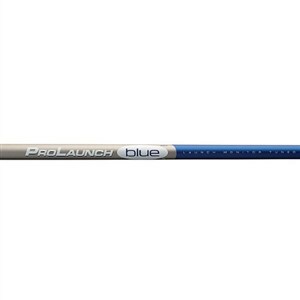 This ProLaunch Blue Iron shaft is designed for slower swingers. It is a very light and flexible shaft that helps high handicappers get the ball up and flying high with ease. Faster swingers should hit the ProLaunch Red that is stiffer and has a lower trajectory. Both of these shafts weigh less than half than steel shafts providing added distance. For a cheaper alternative in steel, you might appreciate these light versions of the standard True Temper Dynamic Gold. The Dynalite Gold SL is 20% lighter than standard steel, and the GS75 is about the same weight as graphite.